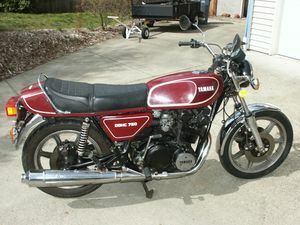 The Yamaha XS750 is a motorcycle produced by Yamaha from 1976 to 1979. 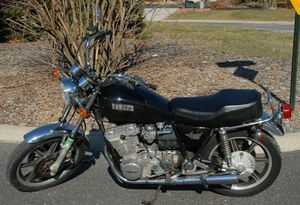 The Yamaha XS 750 Triple Special was produced from 1976 into the 1980s for the worldwide motorcycle market. In the United States, the last model year was 1981. These bikes are usually referred to as "Triples" because they have 3 cylinders. The first 4 model years the bike displaced 750cc. This was increased to 850cc for the final 2 model years. 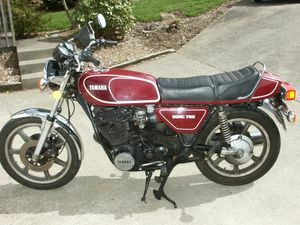 The Yamaha Triple was the most technically innovative bike of its day. In addition to having a 120° three cylinder crank, it also features dual overhead cams, 3 carbs, shaft drive, triple disc brakes and solid alloy wheels. The only modern street triples are the new Triumph 750cc to 955cc bikes. The shaft drive was listed as a best feature by 59 percent of the owners. “Yeah, practice a lot before you go downshifting in turns. Shafties are different!” Only dislike was the mild vibration and oil consumption. 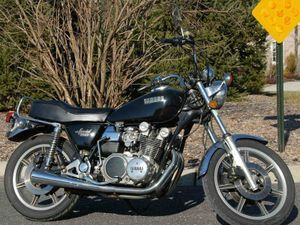 Already famed for its two-strokes, Yamaha had every intention of continuing its growth cycle The firm's ambition in the late Seventies was to challenge the giant Honda on its home ground, the big four-stroke multi. It was a difficult task for Yamaha to implement a new image on the big four-stroke market -already dominated by Honda, followed by Kawasaki and Suzuki -without being tagged as a copycat. Yamaha chose, with varying degrees of success, to go for technical originality, calling on outside designers to develop the technologies in which the firm was not yet experienced. 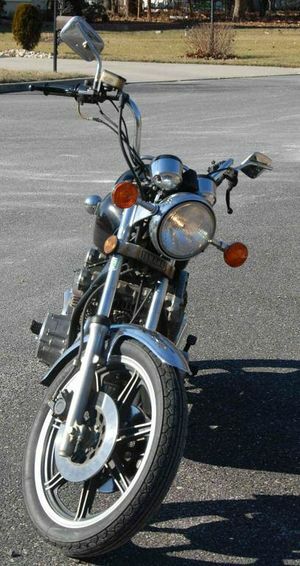 Yamaha chose the prestigious Porsche to develop the twin-cylinder engine of the TX 750 and the shaft drive of the XS750. Porsche was as good as its reputation; the XS was the sole motorcycle whose transmission incorporated a perfectly homokinetic tripode joint behind the gearbox rather than the normal cardan joint. 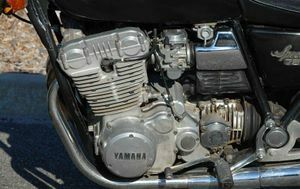 Moreover, the Yamaha was also the only modern Japanese bike equipped with shaft final drive since Lilac had gone out ot' business in 1961. 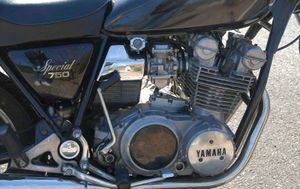 Another original feature of the XS 750 was its engine, whose three cylinders had Firing intervals of 120 degrees, with balance virtually equal to that of a four-cylinder engine (but more costly to achieve), this type of engine has the great advantage of being more narrow. But no matter how technically successful it was, it could not make headway against its four-cylinder rivals. This page was last edited on 28 November 2010, at 22:49.